The years 1987 to 1992 comprised the second driest period in California’s recorded climate history. For six years, precipitation in the state was only about three-quarters of the recorded average, while streamflow was a mere one-half of the average. many of the most severe and long-lasting impacts of the recent drought fell on the state’s natural environment. Moreover, future droughts are likely to cause still more severe impacts to California’s environmental resources. Drought is a natural phenomenon, which may potentially contribute to stability of ecosystems over the long-term; however, the resistance of species and ecosystems to natural stresses is dependent upon the condition of ecosystems prior to the onset of drought. Highly modified ecosystems, such as those encountered throughout California, are much more likely to suffer permanent changes during extended dry periods. California’s plant and animal populations have weathered droughts of comparable severity in the past; yet there are many factors today that prevent wild populations from rebounding from a drought as they once might have. Among the most important are the extremely small size of many populations and the fragmentation of habitats. Small populations are more likely to become extinct as a result of droughts, while fragmented habitats make it impossible for species to migrate to seek better conditions during drought and also preclude the natural recolonization of areas following a sever drought. 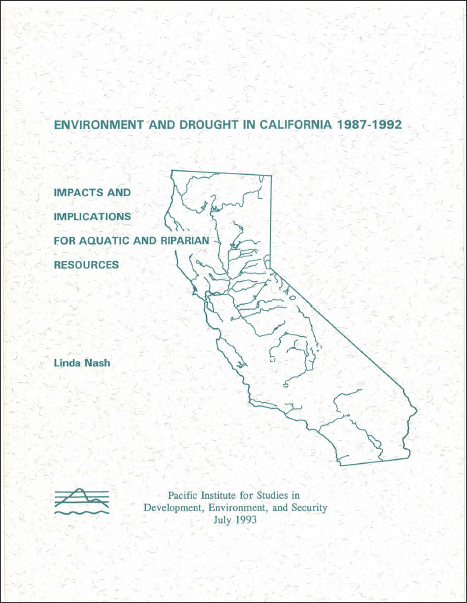 Download the “Environment and Drought in California 1987-1992” (PDF).